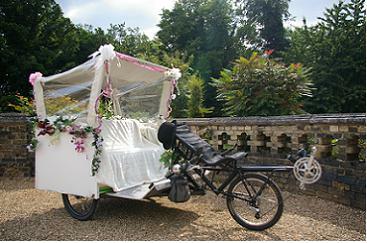 The beautiful wedding chariots are the perfect and unique choice to whisk you away for a romantic journey. You can enjoy a luxury of private ride, while we can arrange organic champagne, fairtrade chocolates, or even music of your choice. Eco Chariots offer environmentally friendly and entertaining transport for the newlyweds or the whole wedding party mainly in central London. We can advice and help you to add an original touch to your day. You can plan a route, select decorations, such as flowers, ribbons or banners, the choice is yours.